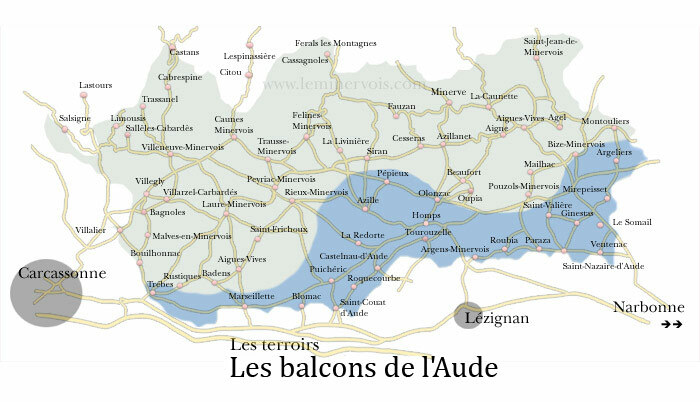 The whole winegrowing zone around the Canal du Midi, especially that part situated to the south / south-east of the Minervois, is the one that is the most influenced by the Mediterranean Sea (barely 30 km away as the crow flies). 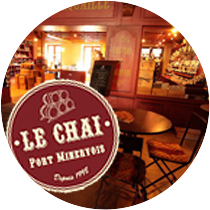 It is characterised by temperatures that are often higher than the average for the Minervois, with overall ranges tempered by the maritime influence. Rainfall is fairly well distributed over the course of the year, allowing regular nourishment for the vines. The soil types alternate between eroded sandstone of varying depth and stony quaternary-era terraces that allow varying degrees of filtrations. 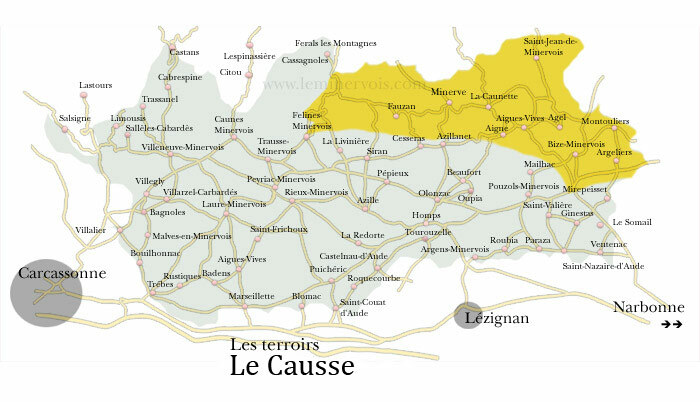 This is the the Minervois’ most precocious zone of (from 2 to 3 weeks ahead for the harvest compared to later sectors) and guarantees the rapid and regular ripening of the grapes. For grape varieties that need a lot of heat, like Mourvèdre. it is the zone of choice. This winegrowing zone is notable for its altitude, which ranges from 200m to nearly 500m. This results in the lowest night-time temperatures in the Minervois, and a slower thermal reheating in the spring. 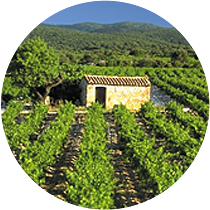 This zone’s semi-mountainous climate is also characterised by heavier and more regular rainfall than in the Minervois overall. The other important feature of this zone is the dominance of limestone soils, which can lead to a very stony surface. Whether the stone is hard or soft, the whiteness it lends the ground allows for indirect reheating of the plants and the grapes through radiation. Caught between the limestone of Les Causses to the north and the Serre d’Oupia (a hill reaching a height of almost 300m) to the south, this sector is one of the hottest and driest in the Minervois. The mediterranean vegetation that develops on these hilly uplands only leaves space for the vine when there is sufficient depth of usable soil. 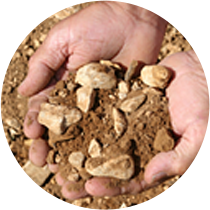 Sandstone soils dominate in this terroir, varying in terms of erosion and depth. Visible on the side of the road or in the ditches, the banks of sandstone are impenetrable obstacles for the vine roots. 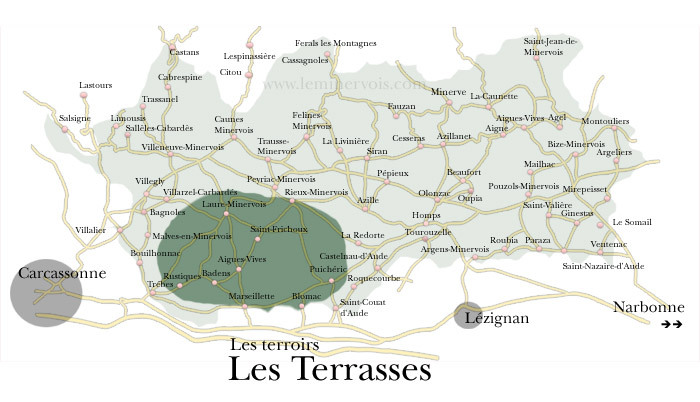 Characterised by its slopes and foothills, this zone is one of the most precocious and hottest in the Minervois. The wines there are often concentrated, warm and complex, characterised by aromas of stewed fruit and blackcurrant. Stretching all the way along the piedmont of the Black Mountain, this zone benefits from an almost universal southern exposure. 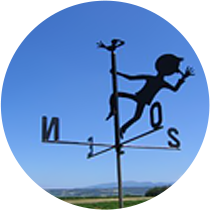 The temperature peaks are amongst the highest in the Minervois, and the rainfall amongst the lowest. A hot, dry, mediterranean sector ; here the viticulture of the slopes meets the garrigue. This zone often presents constraints for the vines, due to a lack of water supply. The eroded sandstone soils dominate this terroir, squeezed between the first limetone areas of the Causses and the stony quaternary-era terraces of the banks of the Ognon and Argent Double rivers. 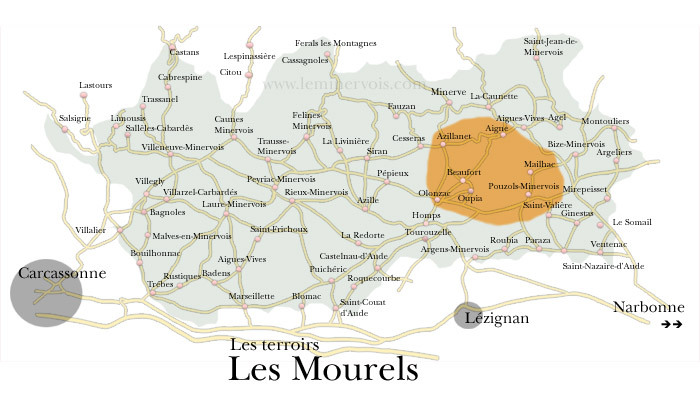 It is one of the most early-maturing and hottest zones of the Minervois. 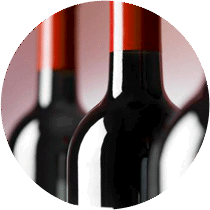 Wines there are often concentrated, warm and complex, characterised by aromas of stewed fruit. Facing the Alaric Mountain, gateway to the Corbières, and overhanging the drained marshland of Marseillette, the central zone of the Minervois is the most temperate, as the Mediterranean and oceanic influences there are greatly reduced. The temperatures are quite high, even if the nights are a bit cooler than average, and there is little precipitation. It is a moderate, intermediary zone, allowing the vine to develop in optimal condtions. Here also, we find sandstone soils (of varying depths), which alternate wtih stony quaternary-era terraces. The specific area around Marseillette is composed of alluvial soils. 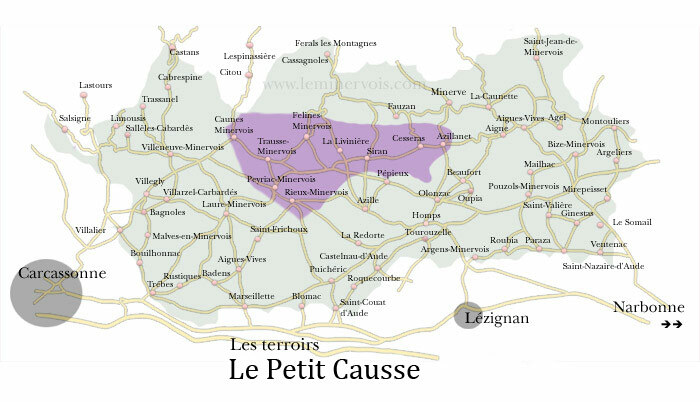 It is one of the most temperate zones of the Minervois, where the excesses of the climate are felt the least. Thus, the wines are balanced and filled with great riches in the shape of tannins, polyphenols and anthocyanes (colour).